France Has Changed! Being Vegan in Paris is NOT Sucky Now...With Food Reviews! However, Paris in 2016 was very different. Paris now has many options that are affordable, taste amazing, and aren't a sit-down dinner with wine and 40€ a plate. Parisians have also shifted their minds in some ways and we met many people who knew about vegans and even ate at these restaurants occasionally. I was pleasantly surprised with the progress France has made. Even in a very small town we visited with only 5,000 people hours from Paris, I found a Vegan Desserts book at a natural grocery store! The world is changing and Paris finally changed too. Here are some highlights from my latest trip! The "La Marais" and "Bastille" areas of Paris is still the epicenter of vegan options. 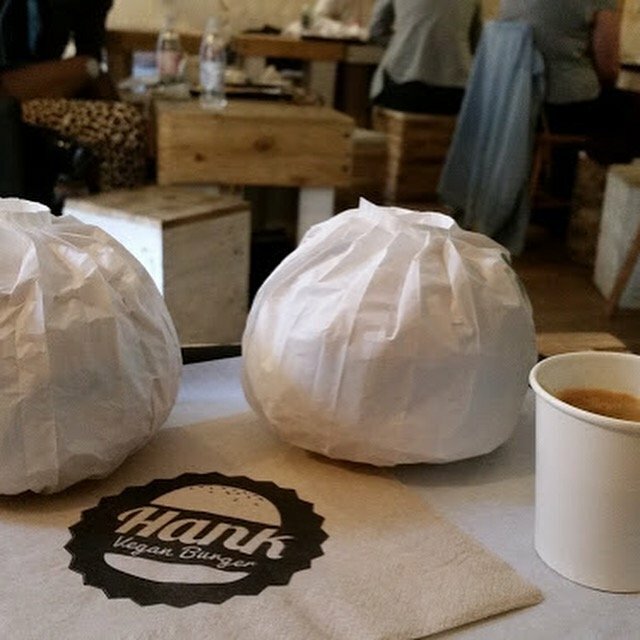 The favorite food of everyone on the trip was Hank Burger. The name sounds a bit boring, and I almost didn't go except I saw the cute bird logo and the tons of great reviews. This is a fast-casual type restaurant where you order at the counter and eat in their cute 2nd story loft. The burgers were the best I've ever had. The bread was fresh, the homemade vegenaise was amazing, and the burger flavors were unique and tasty. I had La Touriste, a burger that is a rotating option. At the time, it was a rocket (arugula) and fig option that was to die for. I had this three times during my week there. There was also the Le Petit Nerveux which had coriander and tortilla chips that was really good. This little place was open all day without closing 20x during the day, the staff was really nice and spoke English, and the price was very affordable with a burger, drink and side for only 12€! I was dying to go to Soya after missing it on the trip in 2013. We finally got to it at lunch time even though it's pretty out of the way from central Paris. It was my understanding that it was a vegan place, but it's actually vegetarian and poorly marked. The board had a few specials for the day and one was lasagna, thinking this was an all vegan place, I ordered it and it was covered in cheese (an ingredient that wasn't listed). They were out of most of the dishes, so my only semi-good looking option was a place with raw vegetables, three kinds of hummus and bread. It was okay, it was fresh, it was more expensive, and I wish I went to Hank Burger! I heard brunch was the thing not to miss, so maybe try that instead. Be careful that items may not be marked correctly with vegetarian or vegan and ask before ordering. We had a big party at Le Potager du Marais even though the place is tiny. It was a big hit and everyone loved their dishes. I made the reservation about an hour before, and they accommodated a table for 10 at 7pm. We also shared the place with Moby's party of 5. They let us have the table until closing which allowed us to sit, eat and drink for three hours. They have pretty great wine and serve a few seitan dishes that I liked. People liked the quinoa burger plate with a side of potatoes. The chocolate volcano cake was very good. The seitan bourguignon and the spinach lasagna were a bit funky. The seitan was chewy and the spinach lasagna had almost 90% spinach. I would suggest this place as a good place for a large party, good service, and some good dishes. Stay clear of some of the more funky dishes, and you should be okay. My favorite Loving Hut in the world is still the Paris one. They still have their amazing dishes: the crepe and quiche. We had these probably four times during the trip and even brought two quiches on the plane ride back. Everyone loves these dishes, the prices are very reasonable, and the service is great too. Pick up some vegan chocolate croissants in a bag on the way out to get your croissant fix too!